Q: What is the difference between "swinging" and "polyamory"? I was there and this is the way a lot of people lived, from the details in the props and costumes to the ambivalence toward the women's movement and open marriage. In the Seventies, rehab was where repeat offender felons went. We were playing it by ear. I gasped when the new neighbor popped a Quaalude; it was possible to O.D. on two, if mixed with alcohol. Easyrider magazine ran a special editorial, warning its readers NOT to use this counterfeited prescription drug. 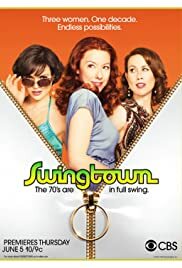 Swingtime shows both sides; the remorseful housewife who returns to church, family in tow, after her fling with the neighbors, the young girl disgusted with her mother's addiction and promiscuity, the kitschy hor-d'oerves and party games at the house-warming--can't wait to see if they get the best friend from the old neighborhood to give a Tupperware party! If you don't 'grok', you weren't there! Go back to your Xbox or Wi. The rest of us have a new guilty pleasure.